When the line between fact and fiction blurs, whose story is it anyway? Pulitzer Prize nominated "Collected Stories" depicts the conflict between an established writer and her ambitious student who becomes a protégé, disciple, colleague, friend and rival. This provocative play, from Pulitzer Prize winning playwright Donald Margulies is literate, intelligent and sensitive, with characters of both dramatic and human interest. Through six scenes covering six years, the two women renegotiate their relationship's shifting sand in an "engaging, witty and painful" play. "This is probably Margulies' best play to date." -NY Post. 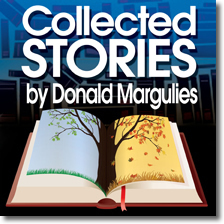 Collected Stories is part of Playhouse on Park's Professional Guest Artist Series! Willi Burke (Ruth) made her Broadway debut as Thea in Bock and Harnick's "Fiorello", directed by George Abbott. In "On the Twentieth Century" she created the roles of Imelda and Dr. Johnson, directed by Harold Prince, who also directed her in "A Doll's Life" with George Hearn. She sang with Robert Weede in "Cry For Us All", and Nagle Jackson directed her in "The Utter Glory of Morrissey Hall" with Celeste Holm. In L.A., directed by Gower Champion, she appeared opposite Robert Goulet in "The Happy Time" and was Roxanne to Jose Ferrar's Cyrano in Forrest and Wright's "A Song for Cyrano". Regional credits include Anna in "The King and I", Maria in "The Sound of Music", Agnes in "I Do, I Do", Eliza in "My Fair Lady". Television audiences have seen her as Fran Gordon in "One Life to LIve", Ruth Martin on "All My Children" and Judge Baker on "Another World". Movie audiences recently saw her in "Choke" with Sam Rockwell and Angelica Houston. Pearl Rhein (Lisa) - is a recent graduate of The University of California, San Diego's Graduate Program in Acting. Regional credits include: Memphis and Assume The Position (La Jolla Playhouse). UCSD credits include: "The Misanthrope", "Pericles", "Twelfth Night", "R&G Are Dead". Pearl originated the roles of Suzanne in "The Further Adventures of Suzanne and Monica" and Justice Mayflower in "Freedom, New York" as part of UCSD's Baldwin New Play Festival. She then originated the role of Marlena Fuchtsoften in the complete travesty Vaudeveaux Nouville, also at UCSD. Pearl is a professional composer/arranger & musician (piano, violin, organ & accordion), and performs as a singer-songwriter.